We had a very rare snowstorm here which left the ground covered in 8" of snow and trees covered in snow and ice. It'll likely all melt away in the coming days as we have sunny days and temps rise above freezing. I noticed some birds poking around the snow on my back deck, so I cut up some raw untoasted walnuts and almonds into small pieces and and scattered them out on the deck and have seen a number of small birds stopping by to feed. I travel away from home a lot and can't reliably keep a bird feeder stocked, so I'm wondering if this temporary food source is helpful or harmful to the birds since I'm not going to keep it up after the snow melts. My concern about harm is about causing them to change their behavior and training them to keep looking for food on my deck after I stop feeding them in a few days. I'm assuming that the raw nuts I'm feeding them won't cause any harm even if it's not a well balanced diet, but I don't really have anything more suitable. 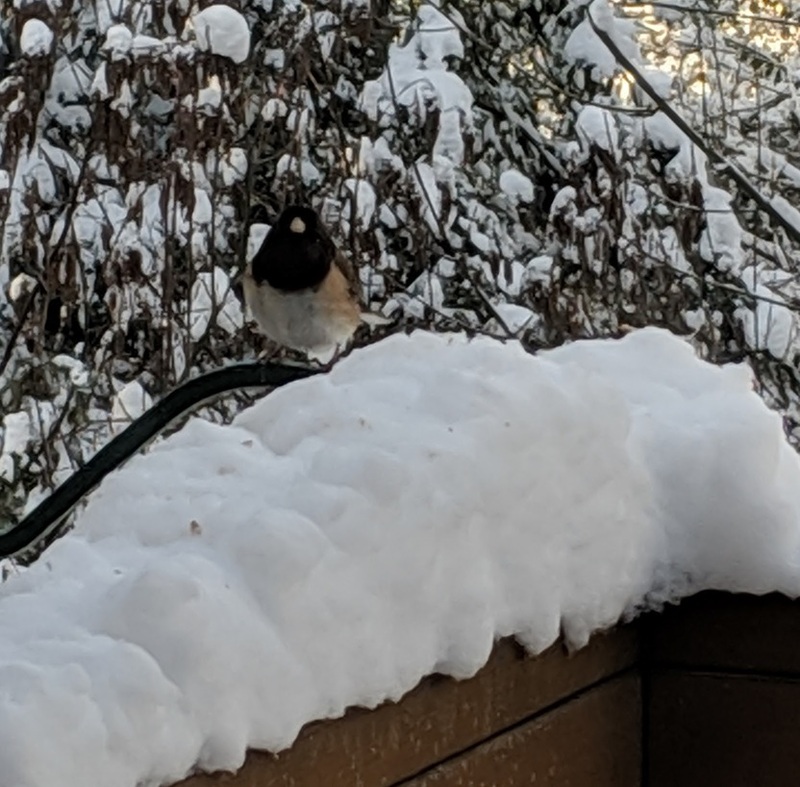 I don't know what type of birds they are, they are around 3" high, typical Pacific Northwest birds, I guess. Feeding for a short period should be helpful, not harmful to the birds, particularly if it is during or following a cold storm. 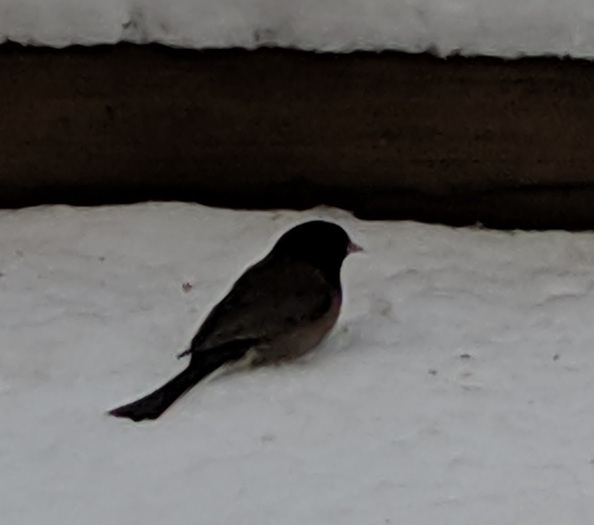 (Ground feeding birds, such as the Junco or Towhee shown in your picture have particular difficulty after a storm covers the ground with snow.) A concern people have with feeding is that feeding will create a dependency of the birds on the artificially supplied food. The worst case of this would be expected to occur during fall migration, where an unusual supply of food might delay birds from migrating, which may be detrimental if they cannot survive the colder weather they may encounter because of the delay. Other than that period, short term feeding should not be problematic since the birds will not develop a strong visiting habit over a short period. We did not test what happens when feeders are removed unexpectedly from a site in the middle of winter, but we suspect that this would not be as detrimental as is typically thought. In winter, a natural food patch may disappear suddenly as a result of a winter snow or ice storm or the foraging activities of other flock members. As a result, chickadees apparently track a number of food patches at all times and sample a number of areas continuously no matter how abundant food is in any one patch. This strategy is necessary for surviving in an unpredictable and fluctuating environment. People consider bird feeders to be a very predictable food source, but in terms of evolutionary time, they have only been available for a very short time. For birds, they are probably no different than any other food patch. studies have shown that birds making it through the winter in better physical condition see those benefits carry over into the nesting season. Bird feeding produces significantly earlier egg laying dates, larger clutches of eggs, higher chick weights and higher overall breeding success across a wide range of bird species2,6. Not the answer you're looking for? Browse other questions tagged ornithology behaviour or ask your own question. During a large forest fire, what is the evacuation behavior of birds? Should I be concerned about health (bacteria/lice) after having birds fly directly over me?